Frozen was Disney’s biggest box office success since The Lion King and fans are anxiously awaiting the release on Blu-ray and DVD on March 18th. 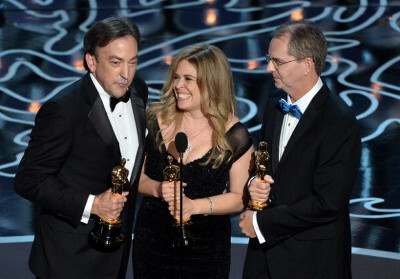 In case you missed it, Frozen won “Best Animated Feature film” and “Best Original Song” for “Let It Go” at The 2014 Academy Awards, so we aren't the only ones who loved it! Kidzworld was lucky enough to travel to Quebec City with Disney on a wonderful adventure. (Click here to read our interview). We followed "In the Footsteps of the Filmmakers" and had the opportunity to interview Michael Giaimo (Art Director), Peter Del Vecho (Producer), Chris Buck (Director), and Jennifer Lee (Director/Screenplay). We started the interviews at Hôtel de Glace talking with Producer Peter Del Vecho (Princess and the Frog and Winnie the Pooh) and Art Director Michael Giaimo (Pocahontas). Michael was in charge of all of the visual components for Frozen, from the color palette to the character and environmental design, plus costuming and lighting. 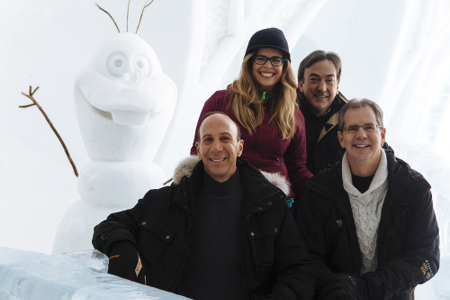 Peter helped build the team that brought Frozen to life! 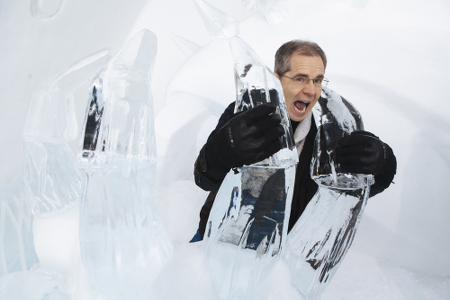 Kidzworld: John Lasseter came to the Hôtel de Glace 5 years ago, what was it like coming in real life? Michael: I came 3 years later. There is a quality here that you can only observe, you can look at a lot of Google image of ice and frost and snow but to really see sculpturally what they created here. Because we knew it could come in handy, because of Elsa creating her ice palace, to see what artisans do with these materials, because Elsa would have to do the same thing in a magical way, with the same materials. We needed to see how they create, so that we could create. We realized there were a couple things that were really special. We realized it’s the imprecations in the ice that create the ice look. It’s the ripples; the scratches and the bubbles that make it look believable. Art Director Michael in the claw of Marshmallow! Kidzworld: Did you ever think about hand drawing parts of the movie? Peter: There are actually a lot of hand drawing influences in the film. In term so of affects certainly heavenly influence, design heavily influence and even animation. We got initially the look from hand drawing and then we pushed it through technology. Michael: But it had to be done hand drawn because the computer is good at calculating things to look in nature but lack whimsy. So the look in “Let it Go” where Elsa is gesturing and cerating snow flurries and magic is all really hand drawn-inspired. 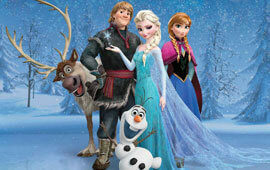 Kidzworld: Can you talk about your journey from starting Frozen to winning The Oscar for Best Animated Film? Peter: Two and a half years ago there was a great idea that was pithed to John by Chris Buck (Director). My role is to help them get it up on the screen by surrounding them with the right team and hiring the writers and putting the story team together. This is the hardest movie I have ever produce and yet also the most rewarding. Because when you can crack that story and get it right and then be backed up by the amazing artwork, animation and lighting you see in the movie, boy, really elevated it. Mike: I would say too that Peter has an incredible gift that all producers should have which is the gift of anticipation. (Laughs). You know seeing the road ahead and then here we are the artist working and helping us be where we need to be, he was really instrumental particularly with the compressed schedule we had. Pretty intense. 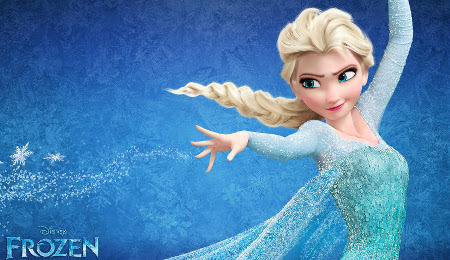 Kidzworld: Sometimes movies like Tangled and Princess and the Frog get great reviews and do well, but they don’t become the phenomenon Frozen has become. What is it like after working in the industry seeing the success? Is it surprising? Peter: Frozen started to take on a life of it’s own. Became bigger than any of us working on it, meaning it started telling us what it needed to be and the whole studio and everyone working on the movie could feel this movie taking shape beyond us. That happens very, very rarely and I think combining that with the fact that it was a very relatable theme. Love versus fear. The characters we tried to make very relatable so that even if you didn’t like what Elsa was doing, you could at least understand why and I think that relateability along with the music that was being written by Bobby Lopez and Kristen Anderson-Lopez it transcended the core themes that we can all relate to, which is why it has been a success in every country it has opened in. Kidzworld: In the Extras – Elsa started out as a Villain, what was the process in realizing that wasn’t working? Michael: We screen the movie for ourselves every 12 weeks and we bring in all the other directors and the other writers and we are very critical, self critical in where the movie is at and one of the things was that it was really hard to understand who Elsa was and why she was doing what she was when she was a straight villain. 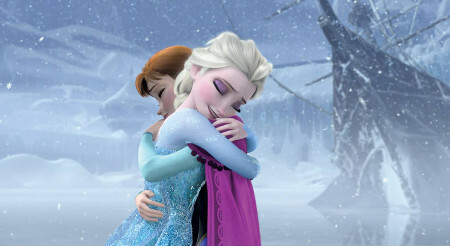 And someone came up with the brilliant idea (honest we don’t even remember who it was) came up with the idea “what if the protagonist, Anna, and Elsa were related?” Because they weren’t always siblings, they weren’t always related, and that was the beginning of finding these characters. And then “Let it Go” was written as a song and it changed who Elsa was. It changed her into someone that was being driven by fear, ruled by fear and Anna was ruled by her own love of other people and her own drive and then that gave us the foundation so much, that song changed so much that Jennifer Lee (Screenplay by) had to go back and rewrite the first act and then that rippled through the entire movie. So that was when we really found the movie and who these characters were. Kidzworld: You show that insta-love isn’t always something that is real. This is one of the first times this has ever been shown in animated film. Was that always part of the story? Peter: We always wanted to talk about different kinds of love, There is love at first sight, there is family love, there is friendship which is a deep kind of love, there is Olaf who represents an innocent view of the world and love. So we always knew that was the theme. We have all had early on relationship in our lives where you grow up and learn there are different phases of love and different types of love and that had never really been dealt with, certainly in an animated movie before. So that to us is what would make this movie rich. Michael: Yeah, and Hans was never originally in the story in older versions he was not in it, Kristoff always was in the story or a version of the Kristoff character and Anna. And then Hans was brought in at one point but he wasn’t always a villain who turned initially, and then someone came up with the idea of him turning. He was always potentially a villain, but we gave it away much sooner. 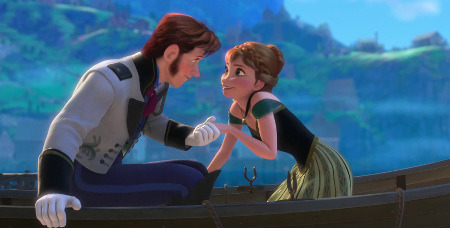 But then what we realized was most important; if we were going to make the ending so surprising you had to believe at one point that Hans was the answer. But then you want the audience to get ahead and realize he’s not the answer, it’s Kristoff. And only in doing that if you can get the audience to leap ahead and think they have figured it out you can surprise them by turning it the other way. Kidzworld: What was it like creating the character Olaf? Peter: With finding the characters voice we struggled with Olaf, we knew he was a comical character but he wasn’t firing off until we got the directors (Chris and Jenn) in the room with Josh Gad for the fist time to record and Josh adlibbed the line “it’s like a baby unicorn” and there was something about that innocence, that child-like view of the world that gave us the key into Olaf from a character point of view and we realized it was that innocent view that also allowed him have heart at the end because he can say things that other characters could say because he says it like a child out of pure innocence so you can buy the lines at the end “Some people are worth melting for” because it’s coming from the innocent place. Kidzworld: What is obvious to you that Olaf would be the runaway character in terms of popularity? Michael: We would say early on to the toy manufacture “make sure you build Olaf” because they originally weren’t going to, we’d say “you’re going to miss it you’ve got to get him.” Thank goodness they listened they probably could have stocked up a little more (laughs) because he is very hard to get in stores. 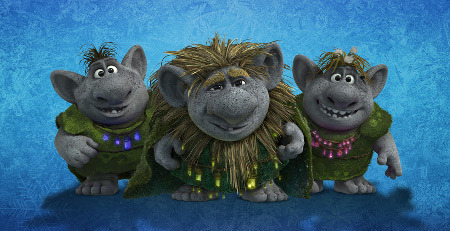 Kidzworld: What was the process in building the trolls into the story? Did they have a bigger role initially? Michael: In terms of the story, we needed a way in the beginning to set up that it is a magical world and the trolls helped us do that. We found that the more we tried to explain things in the beginning the more complicated it got. So where did Elsa’s powers come from? “Now it’s handled by the trolls” is a very simple line. Was she born with it? Or was she cursed? Born, so that answers the question, don’t’ talk about it any more because the more you talk about it to more questions come up. And having them at the beginning and having Kristoff witness what happened also gives him a tie right from that moment from when Elsa strikes Anna, Kristoff has been there and there is a natural tie right from the beginning which he brings back at the end when he thinks he knows the solution is to do the same thing to Anna that happened when she was young, bring her to the trolls, but this time it was her heart not her head. Like in real life you can change people minds but you can’t change your heart, it’s hard to fix a broken heat. Kidzworld: What advice do you have for adults and kids to be more creative? Peter: Somebody gave me advice when I first started, and that was to be flexible and I didn’t really understand it until later in my career and certainly working on this movie. Whatever you think the movie is going to be, it’s not going to be that so you have to be flexible enough to go with change. Because if you hang on to your idea, you will make a mediocre movie. If you are willing to truly collaborate and listen to other people, if they point to an area that’ s a problem you know the audience at some point is going to have a problem with that too. So you willingness to be flexible and to change and adapt is huge. 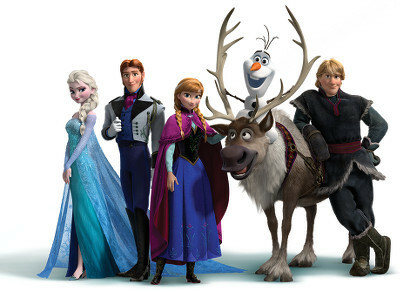 Kidzworld: Any thoughts or discussion for Frozen 2? Peter: Right now we are just enjoying this ride. We haven’t even opened in Japan so we have a lot more to go. It’s been phenomenal the response on the movie and I think that before we even think about what we do next there is a vacation in there to reconnect with our families. Our interview with Peter wrapped up around here, and we were ready (and more than a little excited) to talk to Director Chris Buck and Director/Writer Jennifer Lee. Kidzworld: Is it too early to talk about sequel? Chris: It’s been announced in the press that it is going to Broadway, so there will be new songs. That is really our next step. Kidzworld: Are there any songs that were cut that you would like to see in the play? Jennifer: There were a lot of songs cut, like in the writing process, so not sure they will make their way back in because they are often cut because they don’t fit in the story anymore. Kidzworld: The story changed a great deal, how happy are you to see it finished? Jennifer: We were struggling a lot for a long time because in the originally story the Snow Queen is a villain, and we loved the other theme that is in the story, the more powerful theme, which is love versus fear, and the minute the good versus evil took over and it was really frustrating, but I think it was hard for a lot of us to let go of that (no pun intended – laughs). And then when we started with Bobby and Kristen they said let’s just spend a day, what would Elsa’s day be like where she can just be free and what would it feel like and they wrote “Let It go”. “Let It Go” allowed us to show ourselves and all of our story artist and the other filmmakers in the studio that there was more to do with Elsa and it was more exciting when we made her more complex and conflicted and not a villain, and everyone heard that song and it was when “we get it.” We started over in a lot of way in terms of her character but it was really in a great way and we couldn’t be happier with that. Kidzworld: How did you come up with the wardrobes for the characters? Chris: The reason the team went to Norway was because Mike was going through all of these books and stuff on the Internet and everything that he marked, almost 99% was from Norway. So that is where they went for inspiration and then going there they found that this folk art design rosemaling was all over Norway. It’s in the architecture, the clothing, it’s everywhere. Jennifer: The Bunads from Norway, that’s the style with the rosemaling and all that, more wools, sorted of suited clothing and they certainly pulled that. We did a lot of work in terms of Anna and Elsa. Elsa is very upright and vertical and her colors are very cool, and Anna is triangular and down to earth, so she has more of the bell shape clothing and a lot of warm colors. Everything about her is very warm so we did a lot of play with that too. It was a fun process. Chris: Mike is very detail-oriented. The thing about Mike and I is that we started hand drawing animation where you hand draw and doing the detail on the clothing is almost impossible, it just takes forever. So now suddenly here in GC you don’t have to worry about that. You can put whatever texture and how much detail you want. Chris: We had a blast trying to get everything in there, with taste of course! 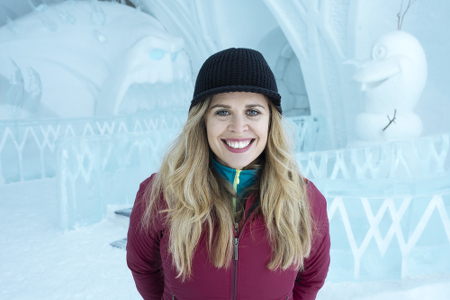 Kidzworld: What impact did the Ice Hotel have on the structure in the film? Chris: Huge! I came here 5 years ago, just 3 of us. It was the kind of place that we thought would have some kind of structure in the movie somewhere that the Snow Queen would build of snow and ice. We didn’t know what it would be, so coming here and seeing all the different rooms and the whole structure of just snow and ice is so impressive. Mike and the art team came a few years ago, and really did a lot of detail research and video of how the light would come through the ice. They also came at night to see how the lights how they lit up the hotel. There is so much of the Hotel in Elsa’s Ice Palace; if you really look at it you can see the inspiration and how it helped us. 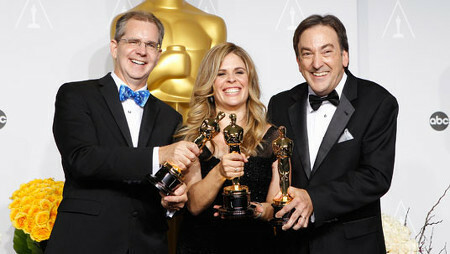 Kidzworld: What was it like starting the movie up to winning the Oscar? Jennifer: For us what’s amazing is that is was a very very hard process to create a story we were satisfied with that we felt did all the things we hoped it would do, was the first challenge and took all the way up until just a few months before the film came out before we felt we "had it". And for it to get the reception it did was another surprise. We remember every day of the journey and all of the staff and crew and cast that worked tediously and reworked and so when it finally got to the Oscars, I have never been so nervous in my entire life. Usually I don’t let that get into my head, but I think I realized how much it would mean to all of these people and Disney Animation had never won, so that day I could barely talk which is also unusual. I think when we won it was just this way of joy and relief because of that. Kidzworld: Chris your speech was very emotional accepting the award, what was it like thanking your son on stage? Chris: I don’t know if you guys read, my son was killed in an accident while we were in New York doing press, it was a car accident. For me it was a real emotional high and low obviously the movie was getting a great response and press (it hadn’t come out yet) but it was doing quite well and then this happened. So for me the whole few months were very schizophrenic. I would go from “oh my god the movie is doing so well!” and then personally I had this other thing. Jennifer: For all of us it meant the Buck Family came everywhere with us. We felt like we had someone obviously looking out for us with all of this. Chris: He would have wanted this and would have been so happy this and would have wanted us to keep going. It’s been a good thing, but a tough one. Kidzworld: One of the great things about the movies is it appeals to both boys and girls. What is it that you think it is that young kids take away from the movie? Jennifer: For us at first most of all we wanted to do characters we felt like no matter boy of girl, that everyone could relate to. That was key; I truly believe that it doesn’t matter if your lead is a female or a male. It’s about a great character and a great story and hopefully that opens up the possibilities of stories we can tell and not be afraid to tell. And that was important for us and we really just worked on them, I think having the balance of the two of us really helped make them genuine, and I think that is a great formula for relatable characters. I hope that people aren’t afraid to go for it, and tell big dynamic stories and not worry whether it’s a girl or a boy. 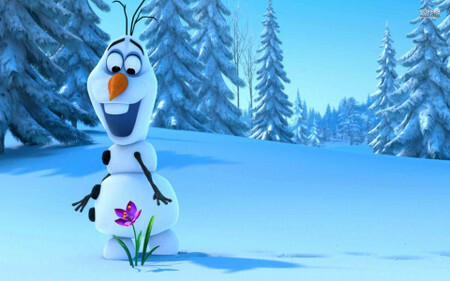 Kidzworld: Can you tell us about Olaf, was he funny to create? Chris: Olaf started before Jenn came on, Olaf started when Elsa was a villain. She created these snowman guards and marshmallow was kind of a holdover from that because he was this scary snowman guard. Olaf was the very first guard she created and it was when Elsa was just beginning her powers so she wasn’t real good at it. So Olaf was her first snowman and we called Olaf “like the first pancake.” You know when you make pancakes and the first one is burned on the bottom, and you throw that one away, that was Olaf. 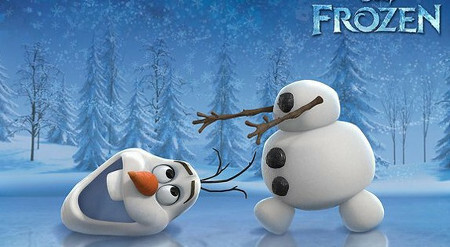 Olaf was always funny; I love the idea as an animator of a character that can do these very broad things, his head can come off his arms can come off he’s just fun to watch. Then when Jenn came on, and rightfully so and very wisely said “Olaf is funny, but he needs a purpose. How does he connect to Anna and Elsa’s journey? It was their story, so how does he connect that?” And that is the idea of creating Olaf when they were young and how it was a special bonding moment for those two. And that was what Olaf represents throughout the movie, and when you see him you think back to when things were good and when their relationship was good. Jennifer: He is that potential to me of the girls reuniting. He’s the reason why, in a way, and it’s that innocent love they have before they were torn apart. I think when he is waddling around with Anna; it’s keeping her going to get to Elsa. It’s just a reminder of the impossible dreams of childhood as well. (And sometimes they come true) He then made sense to me, all of the characters had to represent some form of fear or love, whether they are exploiting fear or exploiting love, or naïve about love, it’s just important that he fit into that. After realizing that, Olaf became the easiest and most fun to write, and before that he was definitely the hardest. Kidzworld: When casting the movie how did you weight actors being able to sing or not? Chris: Celebrity was second on the list, it was really the voice and what was right for the character, and can they sing. We had great actors come in and they couldn’t sing or wouldn’t sing, so we knew we couldn’t go down that road. Kristen Bell was the very first actress to come in for Anna, we did audition a lot of people for that but she was the first and the best. We just fell in love with her. Jennifer: Idina did a table read for us and she and Kristen hadn’t been cast yet and they read the whole script and at the end (We didn’t have any songs written yet), and what they did was sing a duet and they sung “Wind Beneath My Wings,” but they sung it like sisters and what you mean to me. And there wasn’t a dry eye in the house after they sang. Jennifer: That is when they knew, that was the whole potential and understanding the power of music and of what this emotional story can be. 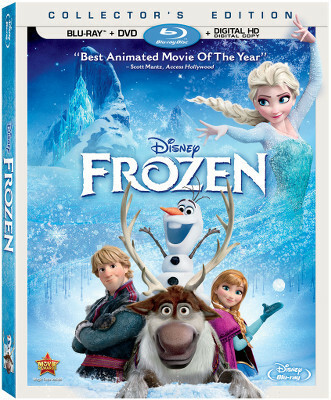 Frozen is available on Blu-ray + DVD March 18th!